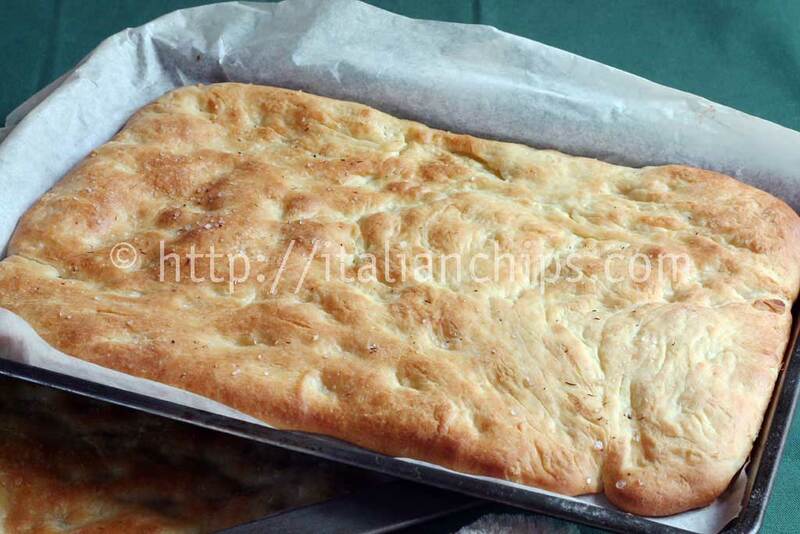 I prepared this potato focaccia recipe yesterday, it was good just as the ones you buy in Italian bakery shops during the morning. When I came to live in Italy, I used to live in a very small city and shop for groceries in a small aunt’s local market. It was about a block from my house, and in between there was the bakery shop (and ovens where bread was baked) of my husband’s uncle. Well…if I happened to go shopping during the morning, around 11:00am, I always get back home with a pizza bianca, just like this one you see here. I just couldn’t resist it. Sometimes I began to eat it on the way back home, sometimes I could wait until arriving home, but I never had leftovers ;-). It is also particularly easy to make. Yesterday I began to knead it with my robot, but it seems to have problems. I then looked for my bread machine that, even if smaller, kneads the same. I then transferred the potato focaccia dough to the bread machine to continue kneading with no problems. It is not a fragile or particular sensible recipe. I used a spiced salt on the top, but it is not mandatory. I used a thyme and olive flavored salt on one pan and Fleur de Sel on the other. Obviously, my good quality extra virgin olive oil on both ;-). 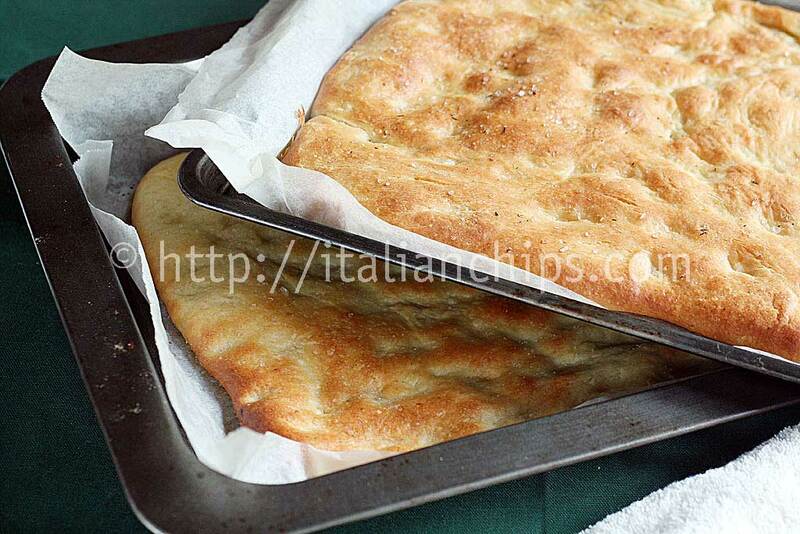 This focaccia recipe gives 2 trays of about 25x30cm/9.8×11.8in. It is good warm but also cold. By itself or with cold cuts. 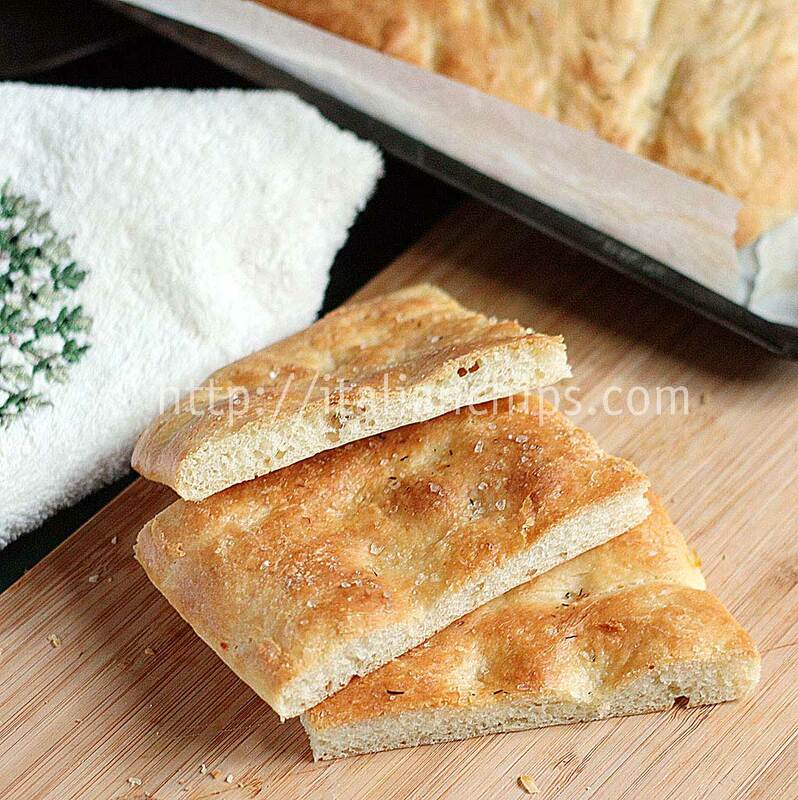 I saw this recipe on this Italian site. In a bowl add the flour, the baker's yeast crumbled, half of the water (lukewarm) and the oil. Begin to knead it and then add the salt. Add the baked and mashed potatoes, the last half of water and continue to knead. Let the dough rest for about 1 hour, covered to avoid drafts. After this time, divide the dough in two and roll them out on two oven trays covered with parchment paper. Let them rest another hour. Preheat the (fan) oven to 220°C/428°F. 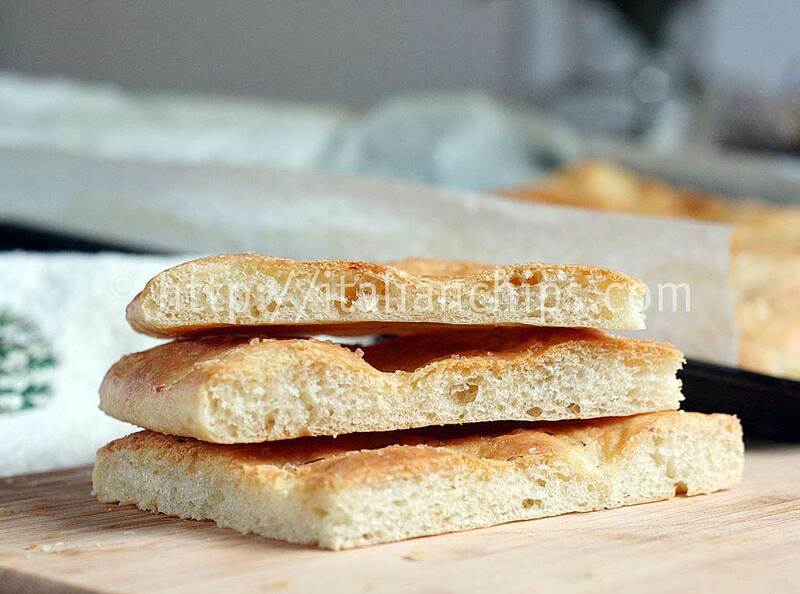 Flatten the dough using your fingers, spread extra virgin olive oil using a kitchen brush and sprinkle some Fleur de Sel or salt. Bake them for about 20 minutes or until colored.